A charming and magical graphic novel adaptation of Louisa May Alcott's LITTLE WOMEN! 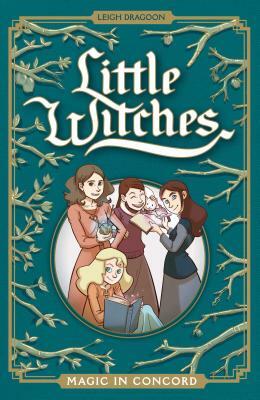 Jo, Beth, Amy, and Meg March are four sisters living in Concord with their parents—Father, who's tending to soldiers fighting in the Civil War, and Marmee, who teaches the girls simple but effective witchcraft. The Marches have to keep their craft quiet, as there are many in Concord who see magic in a bad light—especially after things have begun disappearing. Things take a turn for the worse when Jo and Laurie try investigating on their own, and a dangerous storm takes hold of Concord. There's powerful magic at play here—stronger than anything the Marches, or even Laurie, has ever seen before. Can they hope to defeat it? Or has the magic already become too strong for them to fight against? Leigh Dragoon was raised in a log cabin in the Adirondacks, where she developed an early love of reading and writing. She became a fan of Little Women at age nine, after Beth's demise made her bawl herself to sleep. This led to a life-long appreciation of the book. After years of annual re-reads, she also became fascinated with learning about Louisa May and her family. Leigh has several print publications of her own, both graphic novels and prose, through HarperCollins and Penguin. She adapted both Richelle Mead's VAMPIRE ACADEMY and Marie Lu's LEGEND series into graphic novel scripts. She also written two prose ADVENTURE TIME novels: QUEEN OF ROGUES and THE LONESOME OUTLAW, as well as creating original comics stories and scripts for Mattel's EVER AFTER HIGH and Disney's TANGLED.